Just about every day in Greater Cincinnati, teenagers on youth sports teams are either playing games or practicing. But as WLWT News 5 investigative reporter Todd Dykes discovered, a teenager having fun on a sports field could end up in a hospital emergency room without warning because of a condition called sudden cardiac arrest. 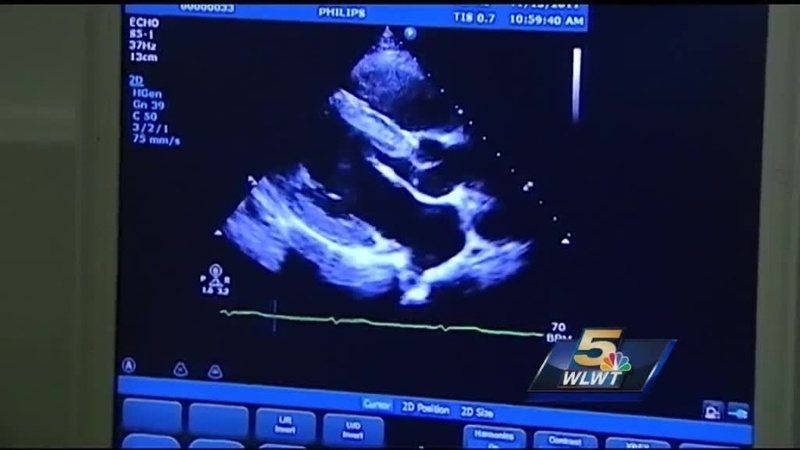 And while the number of high school athletes who experience heart problems out of the blue is extremely low just one case should be enough to heighten awareness among all parents said Brenda Williams, who is a cardiac ICU nurse at Cincinnati Children's Hospital. Williams' awareness about cases of sudden cardiac arrest in young athletes was especially heightened when she took a class called Global Health Policy as part of a nursing master's program. "Since I'm a cardiac nurse, cardiac ICU nurse, I'm always looking at ways to help the Heart Institute or just anything around cardiac," Williams said. She started learning all she could about teenagers who had hidden heart abnormalities. "We had at least two kids that had unfortunately come in and didn't survive from a sudden cardiac arrest, so it got me to start thinking about it. I did a lot of research on sudden cardiac arrest in young athletes," Williams said. "I learned a ton about it. Just that there's a huge variation in how it's found, how it's treated, you know, those kind of things." In a strange twist, the lessons Williams learned in the classroom collided with the real world in August when her son Kyle, a sophomore at Walton Verona High School, almost died at the end of a soccer game. "After we had gone to the shootout I had felt lightheaded, so I sat down and just put my feet up," Kyle Williams said. "Then, after a while, I just kind of blanked out and then next thing I knew I was in the hospital." A couple of months before that incident Kyle had another episode, but a cardiologist checked the 15-year-old out and found nothing alarming, so he was cleared to play. "In our family we have not had any history of any cardiac (issues) whatsoever," Brenda Williams said. But during the game in August Kyle experienced a true case of sudden cardiac arrest which means his heart suddenly stopped beating. "He had played the last 10 minutes of the game, walked off the field," Brenda Williams said. "He recognized he was about to pass out again. He was familiar with the symptoms, so he laid down, put his feet up, drank like he was supposed to. The trainer had a feeling something wasn't right. She went ahead and called for help. (She) asked somebody to get the AED just in case, and at that point he had stopped breathing. There were a couple of the people that had done the CPR, put the AED on him and successfully resuscitated him, got him in the squad and eventually got him to Children's (Hospital)." Coincidentally, the AED used to save Kyle's life was donated by Cameron's Cause, an organization named after another Northern Kentucky teen who died from a sudden cardiac event while practicing soccer. "Every month I see a kid that probably gets CPR or gets a defibrillator, and it helps," Brenda Williams said. "It resuscitates them. It's so important." She added, "Everything had to fall in place, and there's some reason, you know? We tell him (Kyle) that there's, you know, we'll see what big things he has planned. I mean there's a reason he's here." While wondering what the future holds for her son, Brenda Williams is now on a mission to make sure parents understand how hidden heart issues can affect teenagers and why sports physicals matter. "Most people just expect that it's a given they're able to play. And I think you take it for granted that you're kid's able to play." But Brenda Williams said parents have to put their child's heart health front and center when during the annual sports physical process. "Make sure you're going to someone who actually knows how to screen for certain things and make sure the form is up to date. Make sure they're thoroughly checking your kid out to make sure it is safe for them to push themselves like they do in sports," Williams said. "Does your family have a history of, you know, somebody who sudden arrested below the age of 50? You know, do you have a history of certain defects? Make sure they ask you those questions and think about the questions." Brenda Williams is referring to health providers who conduct physicals and who may end up recommending a young athlete get an EKG or an echocardiogram, each of which examines the heart in different ways. "This (sudden cardiac arrest) is very rare, so you don't want to cause a panic," Dr. Thomas Ryan, a member of Children's Hospital's cardiology team, said. "Overall, rates are extremely low. For the millions and millions of kids who play sports there are very few events, less than a 100 events in any given year. Actually, a lot less than 100 events." But just because incidents of sudden cardiac arrest in children appear to be infrequent doesn't make them any less frightening. "The most common event people have, a sudden cardiac arrest, would be due to something like hypertrophic cardiomyopathy, a thickened heart," Ryan said. "And they had some arrhythmic event, so it was very sudden, unexpected, and they had no knowledge that they had any prior disease or prior problem. As you said that's a pretty scary thing for the parents to witness, and it's a pretty scary thing for the child to experience." It's important to note there are critics who are not happy when doctors who say sudden cardiac arrest events are rare. They said there's simply not enough data to make such a statement. In order to better understand the scope of sudden cardiac arrest events the National Institutes of Health and the Centers for Disease Control created the "Sudden Death In The Young Registry" in 2013. The registry is tracking sudden unexpected deaths in people 24 and younger. So far, it appears 10 states are providing information for the registry. As for Ryan, he agrees with Brenda Williams who said it's critical parents share their family's medical history by diligently filling out the health history section of pre-participation physical evaluation forms before arriving at a doctor's office for a sports physical. "Having a good relationship with your physician, period, your pediatrician, your child's pediatrician is always important. There are obviously state-mandated screening and parents are going to go to the pediatrician, take these forms, have them filled out." Ryan said. "And so the question is what's the parents role there? I would say a couple of things. First and foremost, know your child's medical history. Be familiar with all of the things, the procedures your child has had done, any diagnoses they've had, any medications they're on. Second, and a very important point, is to know your family history. So not only mom and dad and brother and sister, but at least one generation back. "Mom and dad should know their own parents and siblings histories. This includes things like heart attacks, which is what people most often think of, but other things that might not come to mind -- whether someone has a pacemaker, whether they have a heart defect that requires surgery, whether they have a family history of sudden death even if it doesn't seem like it was related to the heart. Someone who had a seizure, who passed out, who was driving a car and wrecked unexpectedly. "Those kind of things are important to think about and to have understood and ironed out before you're put on the spot in your doctor's office in the last minute. So I would certainly encourage parents to read over the form and give it some thought and make sure they're not doing it at the last minute." Ryan said it's critical parents feel comfortable and confident with the feedback a doctor gives them and their child. "A parent knows there child best. And if you go to a physician and you have a concern and they brush it off or it's not as concerning to them, it seems, you have the right to bring it up again. Ask someone else, push a little harder. Sometimes you'll be right. Sometimes it will be a concern that's not founded. But it's always a parent's right and duty, frankly, to push on anything that concerns them." One thing Brenda Williams would like to see is more high school athletes be tested for potential heart defects. She's happy organizations like Giving Hearts a Hand, based in Indiana, and Simon's Fund, based in Pennsylvania, promote EKG exams for teenagers within certain geographical regions, but she knows the prospect of testing every child raises a host of questions. "The cost of it and are there enough providers to actually read all those tests that would be done? Because, you know, think about all these millions of high school athletes," Williams said. Ryan said there are other considerations to keep in mind. "I'm not even sure in a perfect world everyone would get one to be honest with you," Ryan said. "There is a cost involved. An EKG and an Echo have a certain cost that needs to be covered. There certainly aren't (enough) physicians to read EKGs and Echoes (echocardiograms) on all of the several million kids that participate in sports every year. "But you also have to worry about things like, what if a test is a false negative or a false positive? So what if someone on an EKG has a finding that is potentially concerning for some cardiac problem but it's not true, then they're withheld from sports. They have a period of time where they think they have something wrong with them. There's also a false-negative in that they don't catch everything. "Some reports show they don't catch as much as 30 percent, an EKG alone. And so I think the strongest tool, and certainly what I support, is thorough use of the physical and history... When there is a concern, when there is an exam finding that's abnormal. When there's a family history, particularly a first degree relative that's concerning then you move onto the next level of testing with an expert, with a cardiologist who knows how to interpret these tests." Kyle Williams is now in that space, working closely with a cardiologist to figure out what's next. And his parents are not ruling out the possibility of playing sports again. "We don't want to say, 'No. Never.' But we've got to find a good place, at least find a good balance where he can still enjoy running around the backyard with his friends and playing a little bit, but maybe just not that intense," Brenda Williams said. "I don't want to tell him no because who says in a year that he's not stronger and the medications he's on aren't helping? A year is so far away to say what he can or can't do. Right now he's had to stop his soccer and his hockey, but I'm not willing to totally give up yet." Kyle said he's fine with whatever the future brings, and he has this advice for others in the same situation. "You'll get through it and you'll be able to get to the next part where you might find something you like even more even when you can't do sports."